Fall is here. And with it comes bugs, slugs and critters trying to find a warm place to live. 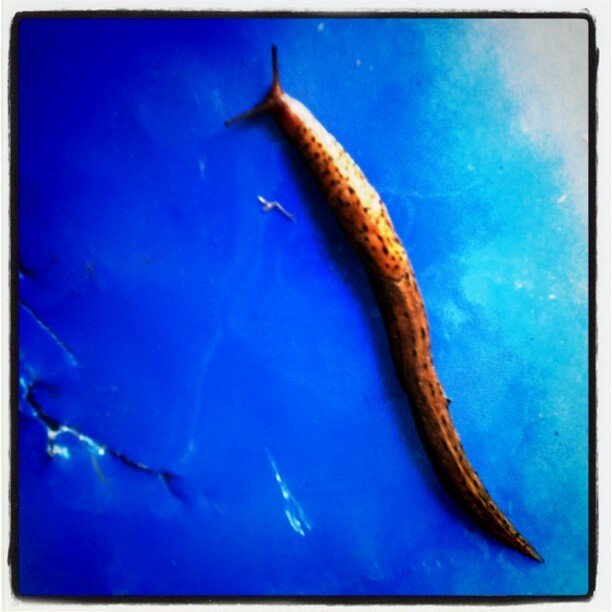 One of the welcome creatures to hide in my wood shed is the gentle slug. I took this photo while my two oldest boys were helping me stack wood and get it out of the rain and in neat rows. They worked very hard on the wood for a change. Being quite young, they aren’t really into working up a sweat for too long. It is usually only 20 to 30 minutes before one of them is complaining of being tired, or hungry, or thirsty. But on this day, it was different. Thanks to the slow moving slug! It was slithering up the wall next to where we were walking back and forth. It had started down by the ground, and was moving slowly higher and higher. The boys would stop to look at it every so often to see it’s progress, at the same time they were looking at their progress on our huge wood pile. At some point they started to see when it was going to be taller than them. First, it was taller than the 5 year old. Then, the 9 year old. Then, it was taller than me. By the time it got 6 feet in the air, we had been doing wood for 2 hours! So, thank you Mr. Slug, or Mrs. Slug (couldn’t tell the difference), you made for a successful wood day!